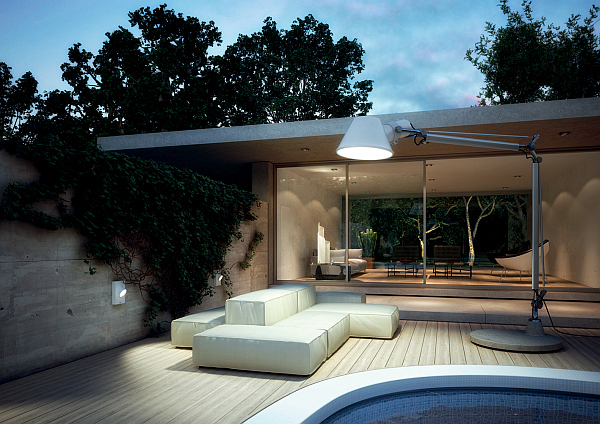 Garden and outdoor lamps are not just about illumination anymore. In this day and age, they are meant to be admired just as much as your flowers, the garden gnomes (maybe) or the comfortable and stylish outdoor furniture. There is something fascinating about the combination of darkness, vegetation and subtle sources of light. Lamps throughout the garden, whether it is thick and lavish or minimally landscaped, can create a magic atmosphere and even a festival feel whether or not there’s a party. It is best to highlight an entrance with floor lamps or lamps mounted on the outside of the house. Sculptural lamps in elementary shapes are well-suited to hide among the vegetation. They do not draw the attention from a floral arrangement, but enhance it. This stylish pendant lamp was designed in 2005 by Philippe Starck. It is suited to hang in any living area, indoor or outdoor, at the house entrance, or on a balcony. The pendant lamp can bring a touch of retro, romance and summertime feelings. The strong light source is diffused by the beautiful, weather resistant wicker material shade in 2 colors, black and beige-brown. 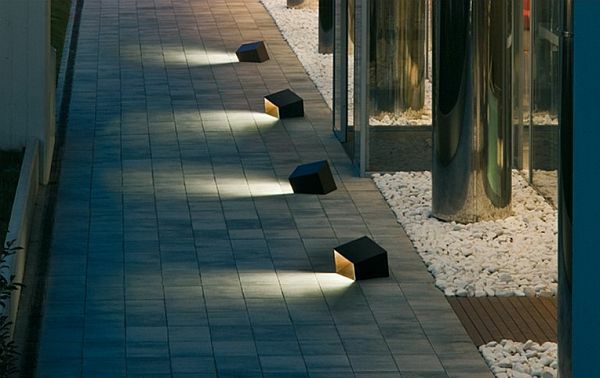 A beautiful and innovative solution for decorative outdoor lighting is the addition of floating water lamps. The water-resistant products are very decorative and create a dreamy atmosphere on a garden pond as they lazily float around with the currents. 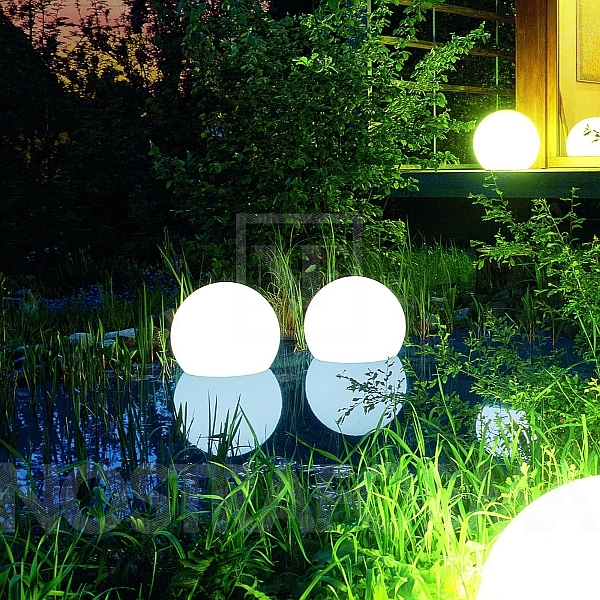 These bright, water and temperature resistant globes by Moonlight can turn any pool party into a fascinating light and water festival. They come in two sizes, 25 cm and 75 cm diameter. They are also UV stable and very sturdy, so you don’t need to worry about kids breaking them. The cute floating lamp, designed by Hector Serrano, has the shape of a classic bedroom shade lamp. But, instead of standing virtuously on a little night stand, in embarks on an inspired water adventure over the pool at night, bringing along the fairy like atmosphere from Shakespeare’s Midsummer night’s dream. 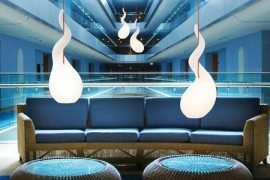 It can be installed underwater to supply diffused but strong illumination from the depth. This lamp is chargeable and very sturdy. This glamorous outdoor lamp designed in 2002 is a piece of art to be installed in the garden, hung over a stylish outdoor living room or, most interesting and my favorite option, hung in the trees. Making a wonderfully-overstated appearance, this lamp is made up of small halogen pins on a large bundle of hand wrapped aluminum wire. 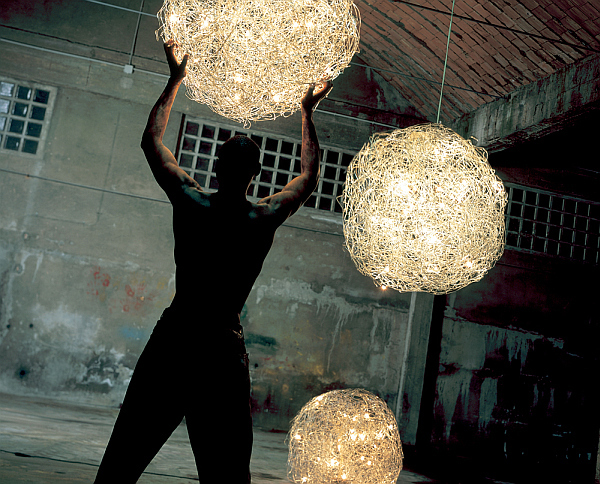 Enzo Catellani, the designer, was inspired in the lamp’s design by tumbleweeds rolling about in the Mexican deserts. 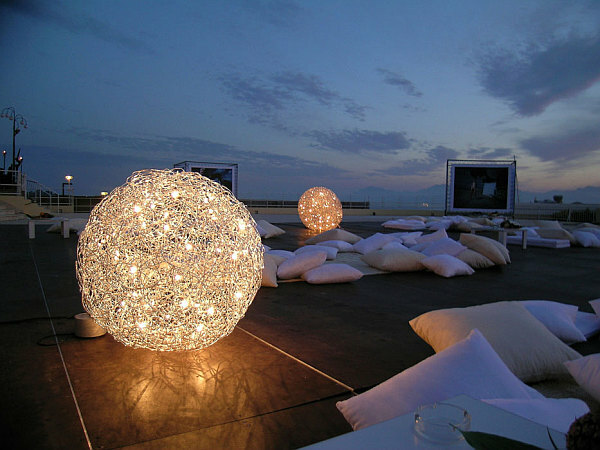 The glowing tumbleweed comes in 5 sizes, the largest with a 90 cm diameter, and brings a luxurious and pleasant atmosphere to the garden. 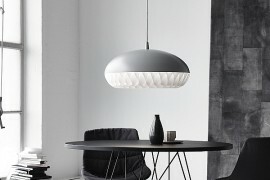 One of the Louis Poulsen classics, PH 3- 2 1/2 was designed by Poul Henningsen. A pair of such lamps flanking a house entrance or lighting the terrace wall convey a timeless elegance and a touch of art. 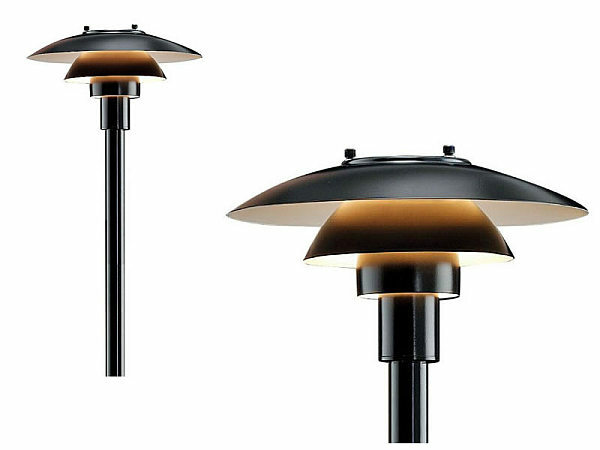 This is a lamp to be enjoyed in combination with rich textures such as dark wood, cultured stone, ceramic. 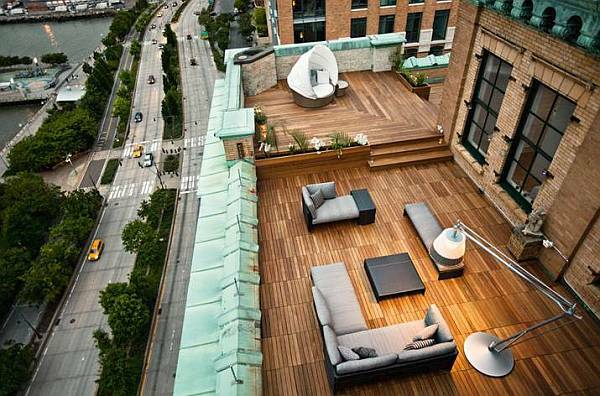 This should be perfect for a house of inspired by Frank Lloyd Wright and is rather classical than minimalist. 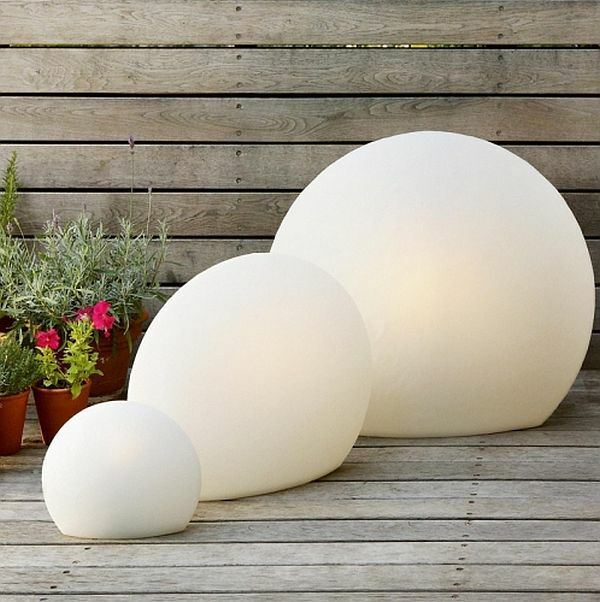 This fun and original outdoor lamp by Catarina von Martèrn and Lisa Landström is a beautiful luminous object that can decorate just about any part of your patio. 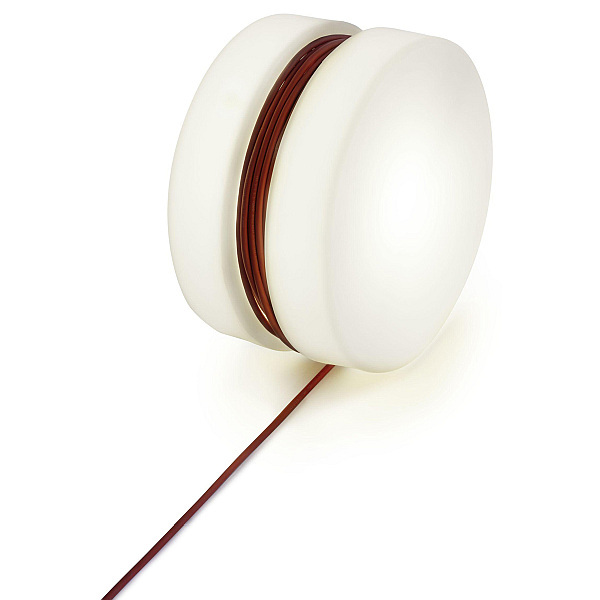 Its design has a functionalist touch, since the cable is also part of the artistic impression. On this cable, the YoYo lamp can be rolled anywhere in the garden. 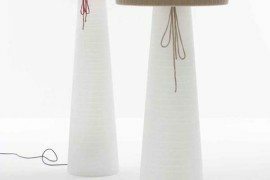 Kids can sit on this funny 50 cm diameter lamp or have fun rolling it around. Everyone should love Yoyo. Watch out as adults may also take on an air of frivolity and play with the YoYo too! 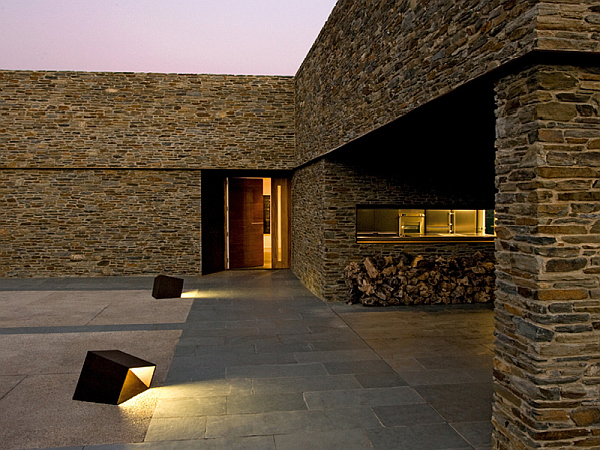 A “buried cube” minimalist lamp by Spanish manufacturer Vibia is a both elegant and cool addition for the walkway of an equally minimalistic home. Besides showing off the beautiful stone, this lamp casts a discreet yet accentuating sheet of indirect light on the wall of the home. The geometric and slightly asymmetric casing (resembling a partially-buried cube) is very modern and comes in several beautiful finishes: sleek white, silver, exposed concrete and, perhaps my favorite, rust. A rather small lamp, it can be the artistic composition of a wall when set in a group of 3 to 5. If you would like a garden with Japanese festival atmosphere, this is the way to go. 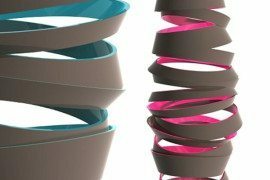 The lamp designed by Emmanuel Gallina in 2009 is inspired by the Japanese cylindrical ruffled paper lanterns and was especially designed with celebrations in mind. 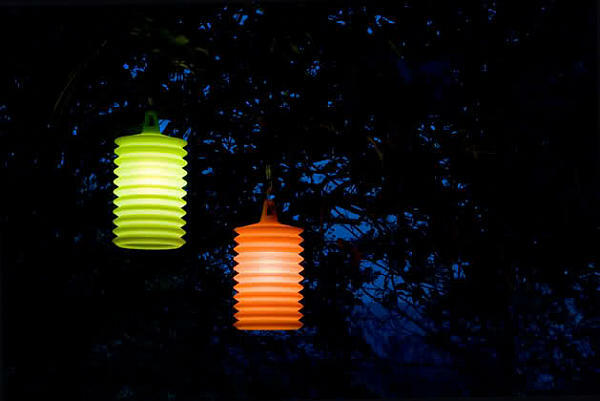 It can easily be hung among the breeches of a tree and is waterproof due to the solid silicone casing that presents a diffuse light. The lamp is offered in green, blue and orange hues. It can also be ordered in a special table lamp version. 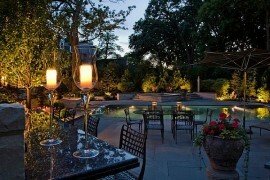 This lovely outdoor lamp was designed by Monika Lipken and it manages to make a bold emotional statement in the patio. It is warm, friendly, sculptural and highly decorative. A wonderful addition among the flowers, by a pond or aside the terrace dining and conversation area, I like the ambiance it brings to a gathering. 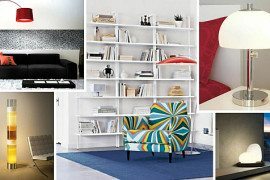 Available in 3 sizes ranging between 25 and 65 cm and 3 beautiful colors: white, a warm beige and a hot red. The textured surface is animated by the diffuse light from the inside. If you love this lamp, you can also find its indoor version at Authentics. These lights are great for dark-fearing children so they don’t feel lonely at night. I myself have one. Spared me a lot of angst, I daresay. 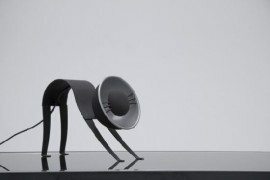 This hyperbolic table lamp is a manifesto by manufacturer Artemide. One of the most popular and successful table lamps of all time, it is used by architects, graphic designers, engineers and others. 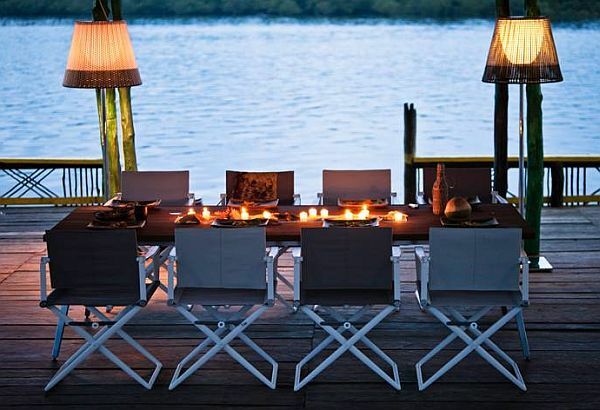 The Tolomeo Tavolo table lamp transformed into the ultimate outdoor lighting sensation which was designed by Michele de Lucchi and Giancarlo Fassina and unveiled at Euroluce Milan in 2009. A 4:1 scale model made possible by use of a base in concrete, while the cantilevered arms on a system of spring balancing are still polished aluminum. 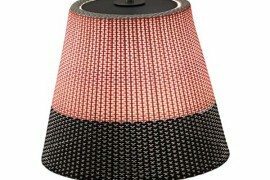 Moreover, the over 60 cm diameter diffuser over the light source filters pleasant warmth. 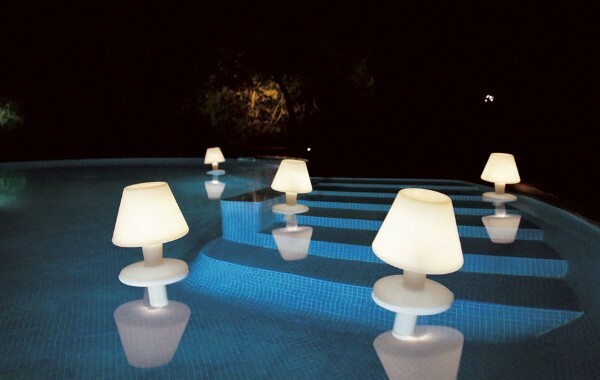 It was designed as an outdoor lamp, however I do not know how many of us would use it as such. 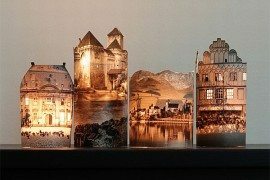 I have loaned one out and used it as an eye-catcher over our lighting consulting table at the construction exhibition in Vienna last February. It was a joy to assemble for the 3 of us who did it, after which I tried to swing on the upper arm. However, during the exhibition, it really did its job, luring astounded visitors by and turning them into believers.